A strong foundation for your site’s search ranking is critical. Search engine optimization (SEO) is one of the most important investments a business owner can make. At first, the rapid growth of a new domain is attractive to Google and other top search engines, and as your domain gains age, it becomes more trusted. However, that growth only lasts if your site demonstrates a pattern of organic expansion and a history of providing useful, high-quality content to visitors. In fact, sites that don’t show steady growth, lack strong landing pages, or are over-optimized or poorly optimized have repeatedly been proven to lose search engine ranking and credibility over time. Naturally, a lower ranking means less engagement on your site, potentially impacting your overall business revenue. Search engine ranking algorithms are changing every day, and your company’s rightful place at the top of page one is always threatened by competing businesses. Consistent updates to Google’s search algorithm constantly keep site owners and web marketing professionals on their toes. Thankfully, the team at Alecan Marketing is always researching the best SEO practices. As such, our clients’ sites survive massive algorithm changes because they are built and refurbished with long-term success in mind. How Does Alecan Perform Organic SEO? We employ enhanced technical features that speed up load times and make your site a destination for calculated relevant search terms. We gain inbound links to your site from industry related high domain authority “good neighborhood” websites, boosting your site’s performance in Google and other search engines. Google’s algorithm evolves at a rapid pace, and our team uses predictive data analysis and research to anticipate upcoming changes. Alecan’s informative, engaging content, both on-page for your visitors and off-page to drive traffic, enhances interest and builds credibility for your business. Understanding customers’ behavior is the key to marketing strategies. Our analytics tools help measure the user behavior in order to make proper adjustments to better deliver results. We design a strong marketing strategy that includes a clearly thought-out conversion funnel in order to ensure that your business gets the most leads, sales, and customers possible. At Alecan, we understand the importance that local SEO can have for a business. 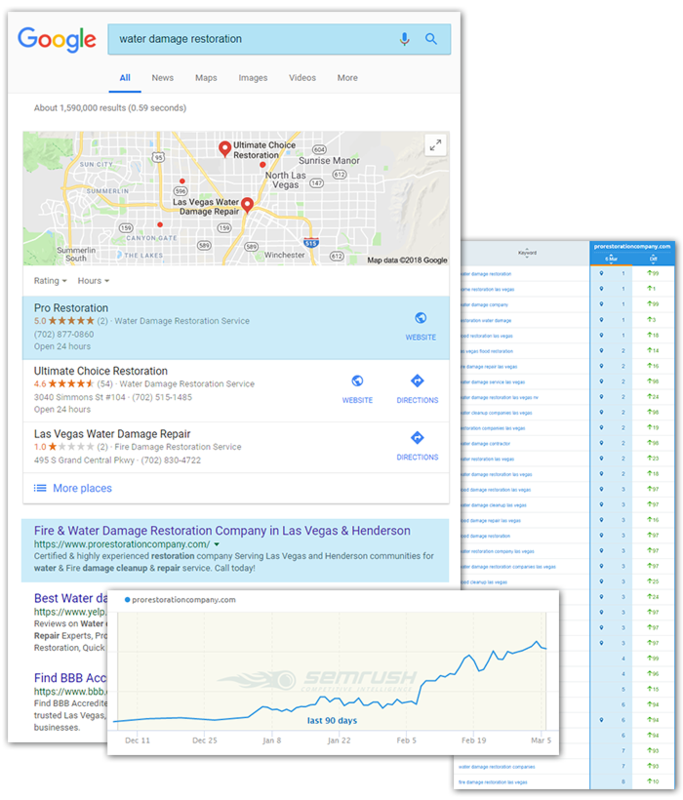 This type of search engine optimization can be a great tool for helping your company rank higher in search engines and making it easier for your customers to find you. 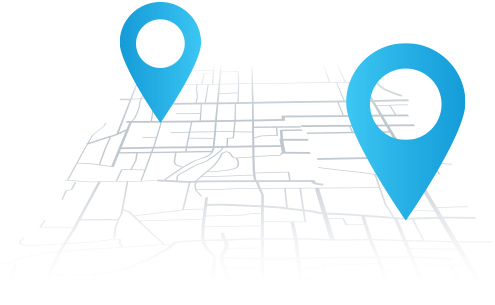 Our team will utilize your company name, phone number, address, and reviews in order to connect your web presence to your specific local area, which will help your business climb to the top of the search engines’ organic results. With more and more people searching for local companies in their own area these days, local SEO is a critical and very effective aspect of digital marketing. We perform search engine optimization with an eye on our clients’ bottom line. Maximizing the return on investment through SEO is a top priority, and we go a step further by providing our clients with insight into how to increase their online presence through other forms of marketing. As a company that offers 24/7 emergency services, Pro Restoration company needed a high-positioned search presence in order to compete with the franchises that surround them and have compelling call-to-action messages, so that their potential customers could quickly find and reach them in the event of a disaster. Call Tracking is a very helpful tool in collecting data, reviewing and measuring employee performance, discovering what your greatest customer demands are, and allowing business owners to see which keywords, ads, landing pages, and campaigns are generating conversions. Keyword Tracking allows our team to collect useful data on a daily basis regarding the keywords that have been selected for your campaigns. We can see which keywords are performing best on various search engines, and we can also track any changes in these performances. When your website visitors follow call-to-actions (such as click to call, purchasing a product, or filling out any inquiry forms), we implement conversion tracking to retrieve that data. This information shows which keywords and campaigns are getting the most attention from your users. When your website visitors call your business or make an inquiry using a call-to-action button or form on your website, we store this data. This information can be used for a number of different tactics, and often proves to be very useful.